Lines to Grayingham Lucky Lad, Dothan Mastermind. Model information: Safari Ltd. Shire mold, produced 2007(?)-current. Lines to Whittlesley Winston, Earnshaw Jewel, Snelson Magnus. 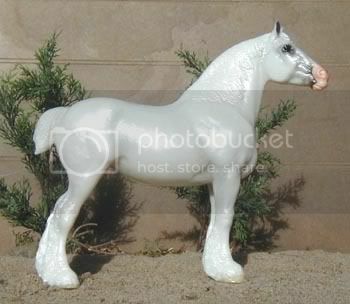 Model information: Breyer Classic scale Shire moldShire, produced 2005-current. Lines to Snelson Magnus, Deighton Commodore, Fox Pine Shenandoah, Fox Valley Gabrielle. 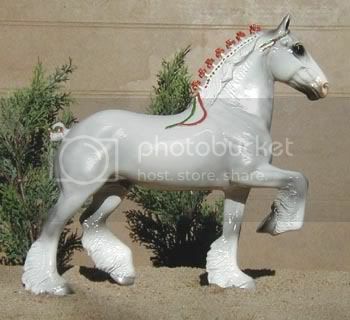 Model information: Stone Trotting Draft mold; #9638 Christmas Clydesdale, produced for Christmas of 1998. 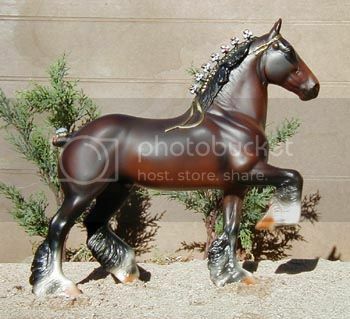 Model information: Stone Trotting Draft mold; #9744 Seal Bay Shire, produced 2000. Yes, palomino. 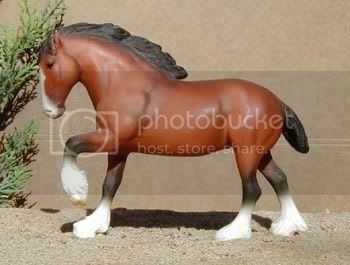 There is one documented dilute strain in American Shires; and chestnut, though rare, is acceptible in the American Shire studbook. Sire is a known red-carrier, and dam is from the known dilute strain. 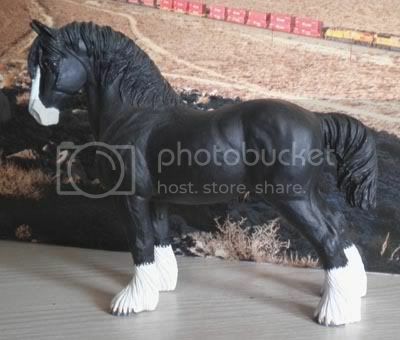 Model information: Breyer Shire mold; Drafters Set, special run for the 1992 Sears Wish Book. Lines to Deighton Commodore, Fox Pine Shenandoah, Fox Valley Gabrielle. 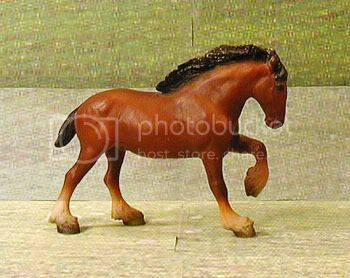 Model information: Breyer Littlebit/Paddock Pal scale Drafter mold; #1604 Clydesdale - Blood Bay, produced 1999-2003. Dam is a multiple champion/reserve and NAN Top Ten. 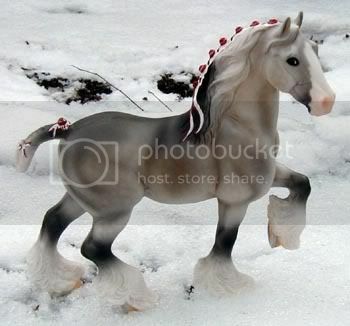 Model information: Breyer Clydesdale Mare mold; Gladwin Lucky Grey Lady, 2003 BreyerFest Celebration Horse. 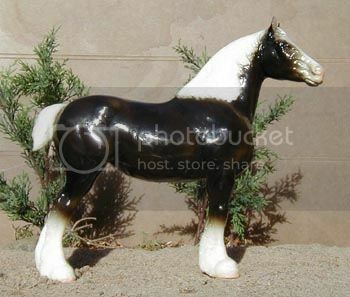 Model information: Breyer Clydesdale Mare mold; "Shannon", 1998 Breyerfest surprise special run, 450 produced. Lines to Grayingham Lucky Lad, Alneland Delegate, Alneland Themis, Lymm Patch, Manor Premiere King. 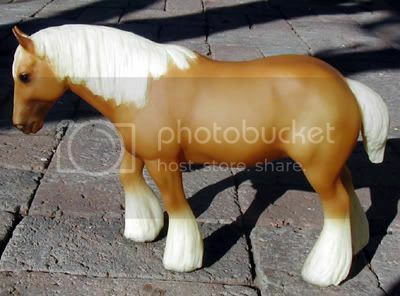 Model information: Breyer Littlebit/Paddock Pal scale Drafter mold; #9025 Clydesdale, produced 1984-1988.